Keeping up with window frosting – Emma Jeffs makes very nice window frosting films, including the Pixel design pictured here. From the site: the film is not affected by condensation (good for kitchens and bathrooms), you can clean it using a damp cloth, it will last for at least three years, and it’s removable, although not reusable. It is positionable while applying, so you’re unlikely to have to leave it crooked. The film comes in a few colors and patterns including Otto, Pixel, and Lace. via Design Sponge. I’m really glad to find this stuff — I have in the past used squares of contact paper to frost a window, but the last time I used it they left adhesive all over the windows. It was a difficult clean up. What I’m up to — We’re looking for a house to buy, and we’re doing it in The Most Overpriced Place in America. The houses in our price range are a little discouraging, but I’m trying to use the new Tivo to grab the before and after house shows to train my eyes to see the potential in a shabby, waterstained and crooked structure. Who knew I would someday be able to tolerate perky tv hosts because they might have something good to do with knocking down some cabinets and throwing up bright curtains? But before we could buy a house we needed to find a new one to rent since the super cool landlords of our last place came back to live for good. We found an arrangement that goes month to month after not too long, praise Craigslist. But the new rental house is kind of small, and cold (Scott calls it the Swamp House). The biggest problem for me is that the kitchen doesn’t have a garbage disposal, those things are miracle machines! I never knew how truly wonderful they were. So now I don’t cook much. Also, since we’ll only be here for few months we only unpacked half the boxes, and we’re surrounded by the rest. And it has rained nearly every day since we moved in. It’s rather depressing. I’m allowing the brand new cable + Tivo to do a Calgon thing on me. Otherwise I am currently obsessed with finding a napkin holder I like. How to stretch a canvas, complete with a how-to slideshow (or thumbnails). at Apartment Therapy. The girls who did the very successful Urban Craft Uprising event here in Seattle have taken over running the monthly (and long running) I Heart Rummage event at the Crocodile. Good for them, I am glad to see it’ll keep going on, and I wish Matthew and Sam the best. I’m rather shocked to find out this site is a finalist for a Bloggie this year. I’m very excited, and so flattered! I’m under Best Craft Weblog and the other sites nominated are terrific, such good company – Yarn Harlot, Make blog, Loobylu, and Angry Chicken. So, by all means, go vote for your favorite at 2006.bloggies.com. Page I’m finding very helpful – So you got a PVR for Christmas… at PVRblog. After a little struggle our Tivo is hooked up and I’ll learn to use it right after I figure out some issues we’re having with volume and buzzing. 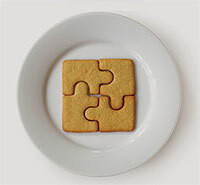 Neato – puzzle cookie cutter by MUJI. A thread of advice for kitchen renovations on Ask Metafilter. I find I am unexpectedly in love with my electric kettle. Who knew I needed to boil water so much? Since our household broke into regular-decaf factions the coffee maker no longer made sense (and really, it was wrecked), and when I burned a second kettle on the (miserable) electric stove we had more than a solid reason to buy something that will shut itself off automatically. But I really wish the translucent orange Bodum Ibis was still in existence. Anyhow, it’s oddly thrilling (and I admit makes me feel disturbingly grown up) to have a hot cup of something really quickly, and a few cycles in the kettle makes boiling lots of pasta water easy. Alton Brown even made vanilla bean creme brulee in an electric kettle on Good Eats. As for coffee we’re using a simple plastic cone and filter that fits right over the mug, it makes better coffee than I expected. Here are some recommended electric kettles for you. When they say cordless they mean the base with the plug sits on the coutertop, and the actual kettle lifts off of it. My week of no interenet and poor television reception* forced me out of the house and I discovered the secret to the Cupcake Royale swirl**, and that The Tomorrow People has come out on dvd. The Tomorrow People! Except for a few strange images I had completely forgotten about that show. I’m so happy to have a place like Rain City Video nearby, they carry a bunch of weird stuff I’d never know about otherwise. * and waiting for the Netflix to be forwarded to the new address, woe was me! ** alright, so it’s not a secret, they decorate them where people can watch. Internet was hooked up to our new place this afternoon and our reaction was like the scene in Space Camp where a tank of much needed oxygen is hooked up to the shuttle. Since Speakeasy DSL cannot reach us out here we had to go for cable internet and, guess what, now we have cable television as well. After years without it we can watch The Daily Show, Adult Swim, Good Eats and finally not have to fiddle endlessly with the reception on channel 13 (which is Fox). For the next few months we can be found in front of our television.